1. Consumers are required to keep their proof of purchase for the length of warranty should verification be needed. 2. Husqvarna reserves the right to ask for this receipt prior to warranty work being performed. 3. Husqvarna branded accessories, spare parts and construction products are excluded from this program. 4. 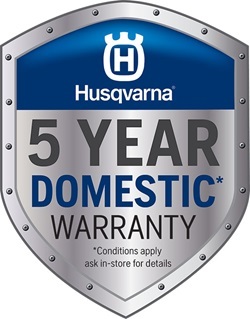 5 Year Domestic Warranty is subject to Husqvarna manufacturers warranty terms and conditions as outlined in the product registration form and in the Warranty and Service Handbook. 5. Husqvarna 5 Year Domestic Warranty program is only available at participating Husqvarna Dealers.